Most people would agree that thoughtful behavior and common decency are in short supply, or simply forgotten in hurried lives of emails, cellphones, and multi-tasking. 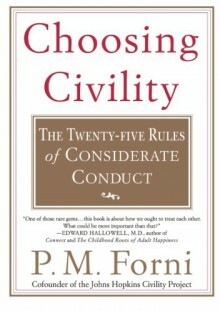 In Choosing Civility, P. M. Forni identifies the twenty-five rules that are most essential in connecting effectively and happily with others. In clear, witty, and, well...civilized language, Forni covers topics that include: * Think Twice Before Asking Favors* Give Constructive Criticism* Refrain from Idle Complaints* Respect Others' Opinions* Don't Shift Responsibility and Blame* Care for Your Guests * Accept and Give PraiseFinally, Forni provides examples of how to put each rule into practice and so make life-and the lives of others-more enjoyable, companionable, and rewarding.Choosing Civility is a simple, practical, perfectly measured, and quietly magical handbook on the lost art of civility and compassion.